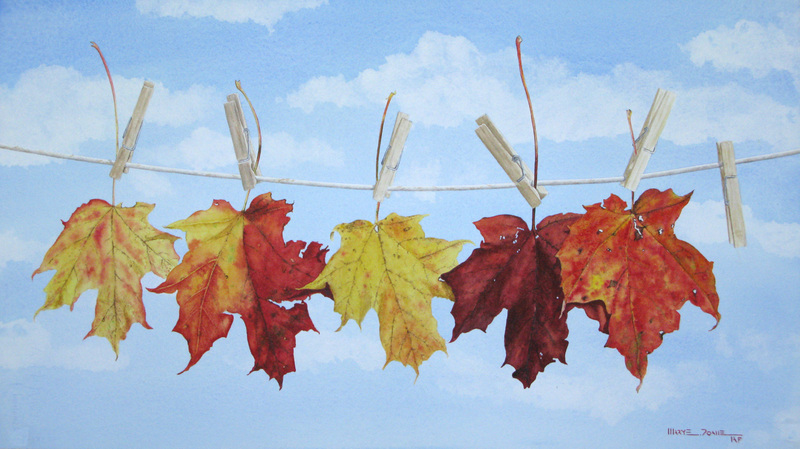 Colourful fall leaves are one of those things that I just can't walk by without picking them up, bringing them inside, and eventually painting them ! These leaves covered my driveway and are all from the same tree, a silver maple. They do not have the brilliant colors of other species but the variety intrigued me. 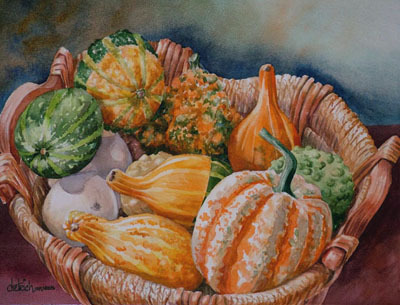 "Charme rustique / Rustic Charm"
This still life in watercolour was done from those beautiful items in front of me (not from photo). 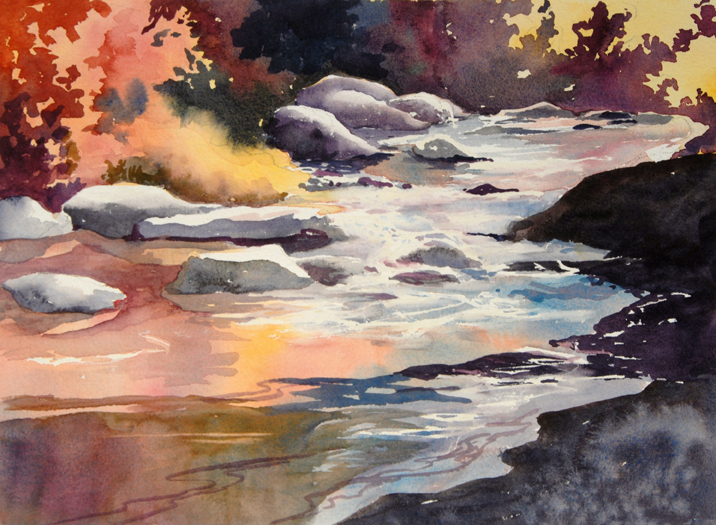 An artist friend of mine told me to put the painting into a juried competition. 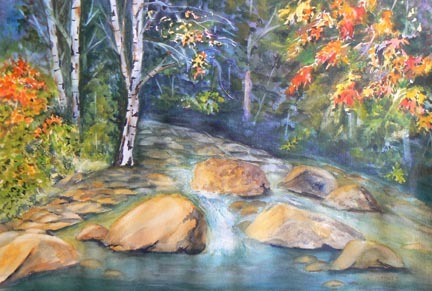 It was Finalist at the National " Rêves d'Automne " in 2006 and the winning paintings were exhibited in Baie Saint-Paul during that Fall Festival presented in the majestic Charlevoix area. Vermont is at the peak of color right now and this is what it looks like. I painted this from a photograph in a style I call "shape painting." Shapes become individual wet-on-wet paintings and interact by sitting next to one another combining into a quilt of color. 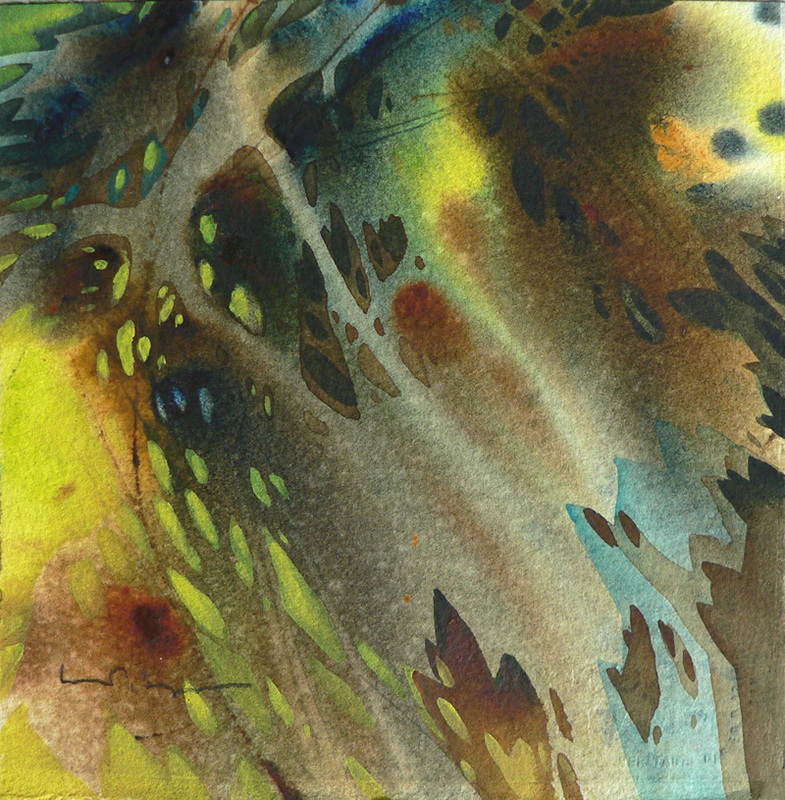 "Windswept - this autumn morning"
Tangles of leaves still cling to their branches despite a cool autumn wind. The colours are softer and slower to turn this year as the Niagara landscape and I await the first hard frost. The scenery at this small lake is always winsome, but in the fall it comes to its full glory. 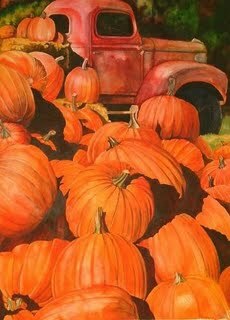 I have always loved vintage trucks and have painted them many times.I also love the beautiful pumpkins of autumn, so combining them in a painting was an obvious choice for me. "Fall at Jay Peak, Vermont"
Recently,I was playing the golf course at Jay Peak. The Autumn color was at it's peak. Spectacular for the golfer & photographer, as well. Great inspiration for a painting. 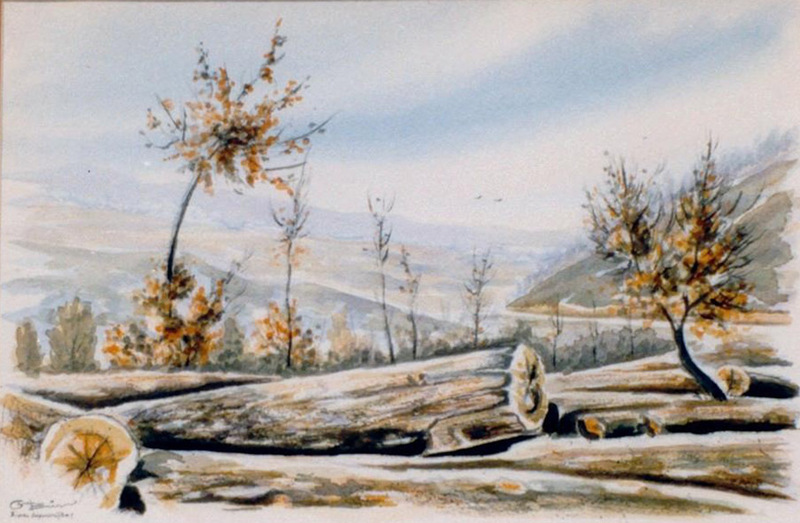 More than 15 years ago, I painted a series of watercolor paintings around the Mount Olympus, North Greece.This painting is of that series, in 1994, an area North of Olympus. You can see in the deep, the mountain range of Pieria, during the autumn. 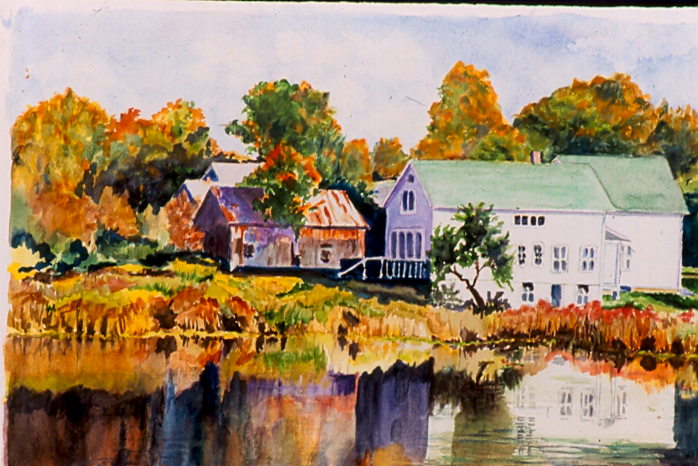 I keep the painting simple with free and bold brush strokes, wet on wet. giving the sense of humidity. 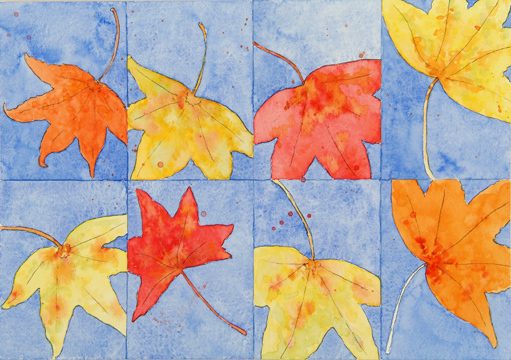 All colors were splashed on wet-into-wet in tints, then enriched with glazes to form negative and positive leaf shapes. Last fall we went camping with a group of dear friends during a beautiful weekend. The fall colors were wonderful! 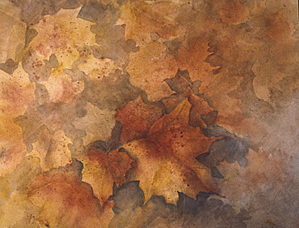 I sat at the picnic table at our campsite one afternoon and painted this using some of the leaves that I'd picked up while walking. It provokes happy memories for me. Does this count for Fall colors? 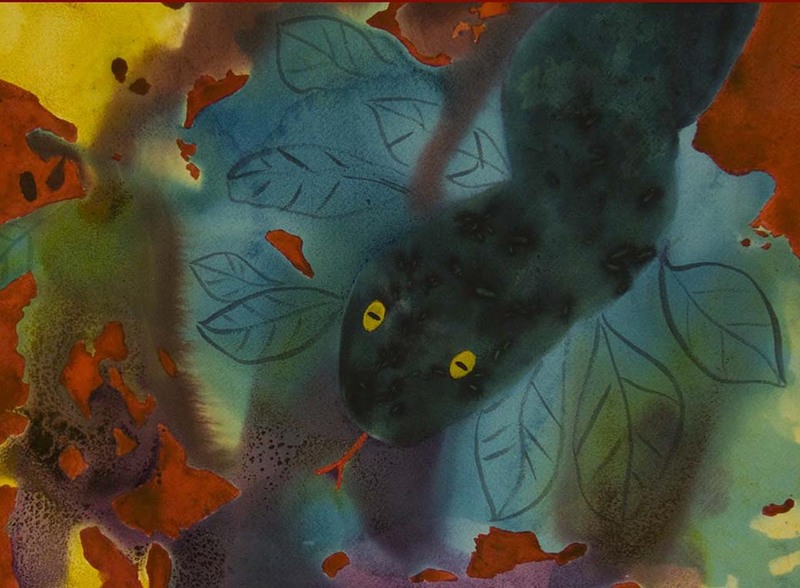 Nosy snake in the apple tree. We went to Purgatory Chasm when in Newport RI. 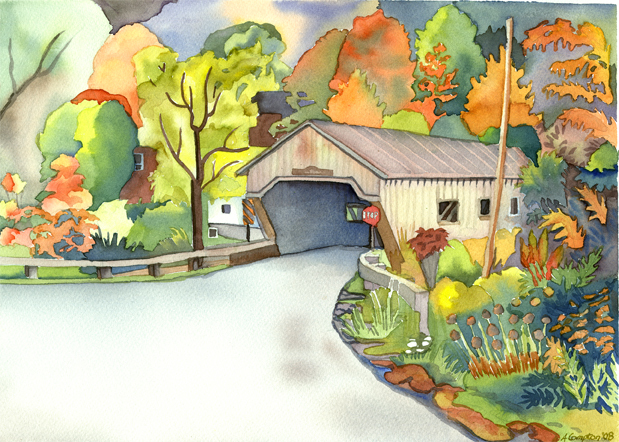 I couldn't paint the chasm but this scene was what I saw the moment I stepped out of the car. 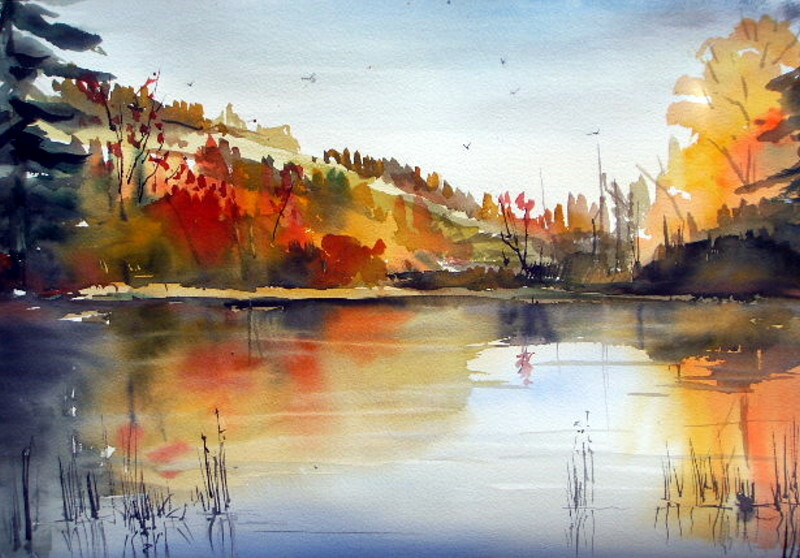 Fall at the lake is another painting without a reference photo. 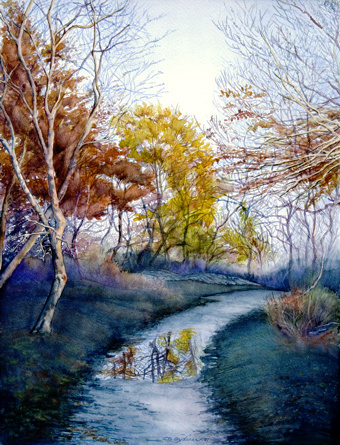 Inspired by a lake my mother in laws holiday home is close by. The lakes is called chapfensee . It was painted only two weeks ago. Here too fall is turning our wold into warm colors. This was painted with lots of masking. Strips of color were painted as an undercoat. I then was careful as I finished to use color with the same temp as the undercoat. I spent a lot of time softning my hard edges after the mask was removed. I have always loved bouquets of fall flowers because of their earthy, subdued colors which differ so from the dazzling, bright colors of summer. 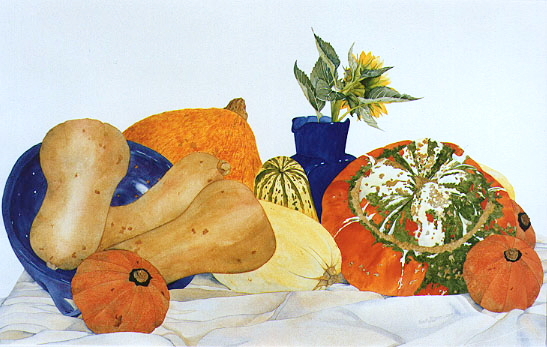 In this painting I've tried to portray what it is that I love so much about these last flowers of the season. Fall at the foot of Old Rag Mountain in the blue ridge mountains of Virginia. A few days ago, a few of my friends and I gathered at Chandler Hill Vineyard and painted the wonderful view from the deck. Chandler Hill Vineyard is close to Defiance, MO which is close to St Louis! Lake Hayes is not far from Queenstown in the south of the South Island of New Zealand - an area much beloved by painters. The lake is backed by the Remarkables (mountains) it is one of my favourite areas, particularly in autumn - or fall! 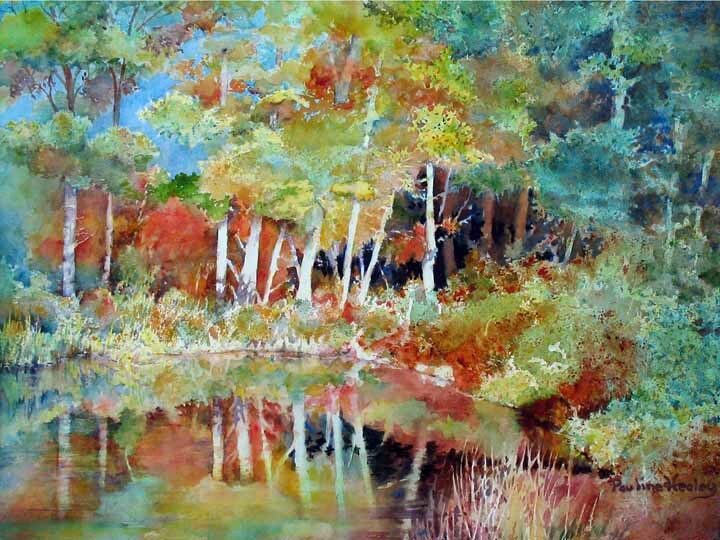 Color of Leaves and the Fall Season is my favorite time of year...fall colors inspire many of my paintings and are fresh with the bright colors of red, yellow, and earth tones.